Tonight we wandered along the popular Sanjo Dori. Tucked between financial institutions and official looking buildings are quaint little restaurants. We found one, an “izakaya”. This was our last night in Japan before we head off home. 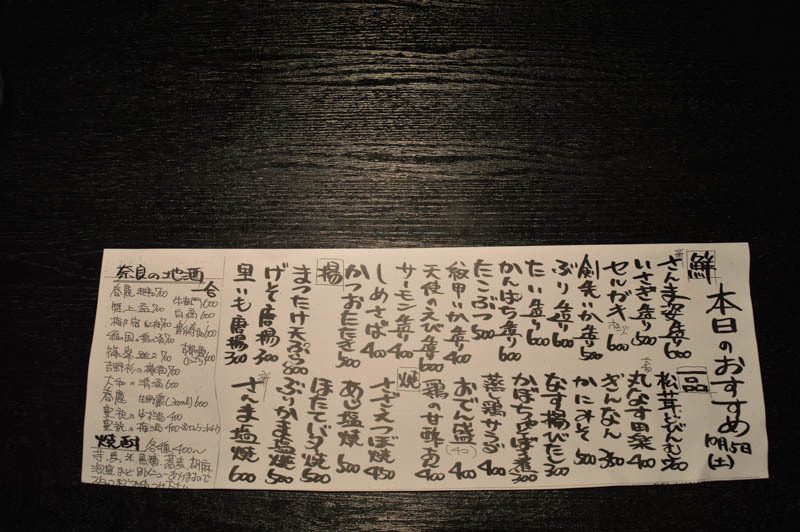 The friendly chefs spoke little English and the menu was in Japanese. We were by now well acquainted with the proceedings and confidently ordered our dishes. Yes, more sashimi, grilled Sanma fish and a delicate broth with dumplings. 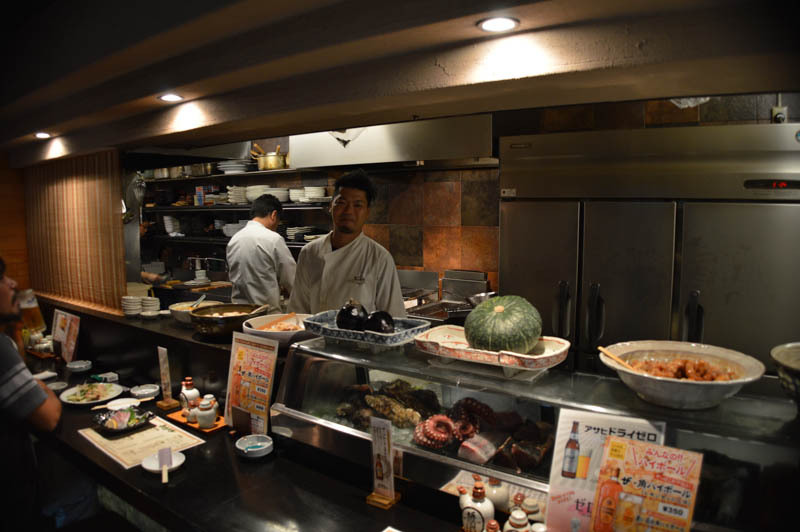 The atmosphere here; like throughout our dining experiences in Japan, was warm, sometimes hilarious and definitely light. As always, appealing presentation, exquisite and delightful taste and flavours. 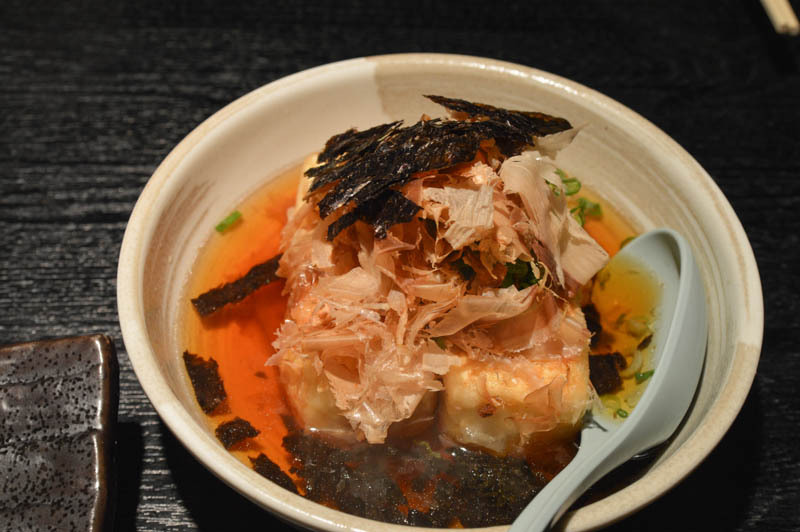 These experiences had set a high mark of Japanese food elsewhere. We returned to our lovely ryokan styled guesthouse. The smiling and inviting face of Kayoko greeted us and ushered us for some hot green tea. Her son joined us. He aspired to be involved in conservation. For now, we encouraged him to finish his school and perhaps consider New Zealand to further his studies and career. Later, we packed up our luggage and quietly walked on the tatami floors and snugged into our soft futon beds. 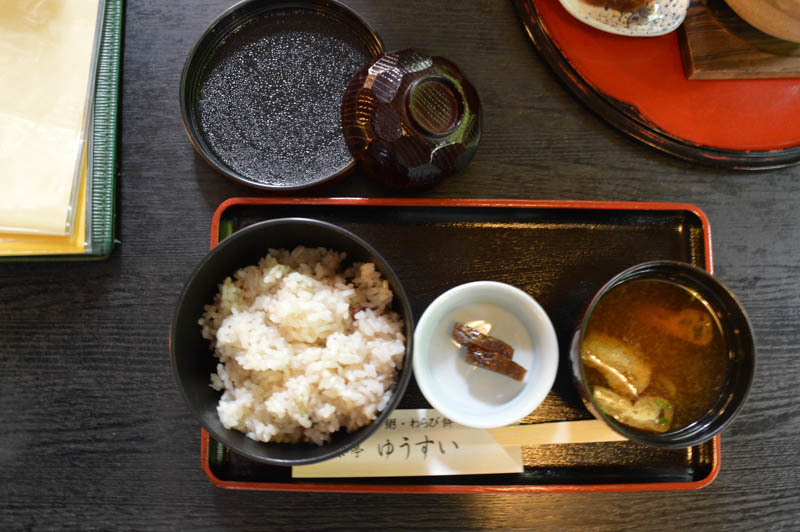 In the morning, Kayoko prepared an early breakfast before a taxi brought us to the Nara Station. From here, we caught a train that took us directly to Osaka’s Kansai International Airport. This journey through mostly central Japan had been an eye- opener to the nature of the Japanese people, their customs, magnificent ancient and historic temples, their delicate culinary, efficient transportation system, did I mention the wonderful Japanese people, and many more. The memories of Japan from my school history books were delivered through this memorable journey. Connecting was convenient with a existence and approachable remains of history – the temples, museums, culture and charming living museums pieces. The stories can be relived and therefore retold. My dreams were fulfilled. This journey is more significant as we had travelled and experienced Japan as a family. Now that is priceless! We approached one of Japan’s iconic temples, Tōdai-ji, via a serene and vegetated pathway. Tōdai-ji was established in 752 and is now a Kegon-shu sect of Buddhism. The centre of a long vermillion coloured building, Chu-mon, is the main entrance into the temple. However, the west end was used today. This building lay opposite a lake, “Kagami- Ike”. Even from a distant, this “Great Eastern Temple” looked impressive. A wide paved path led towards the entrance of the “Daibutsu-den”, Great Buddha Hall. Measuring 57m long and 50m wide make this building the world’s largest wooden structure. 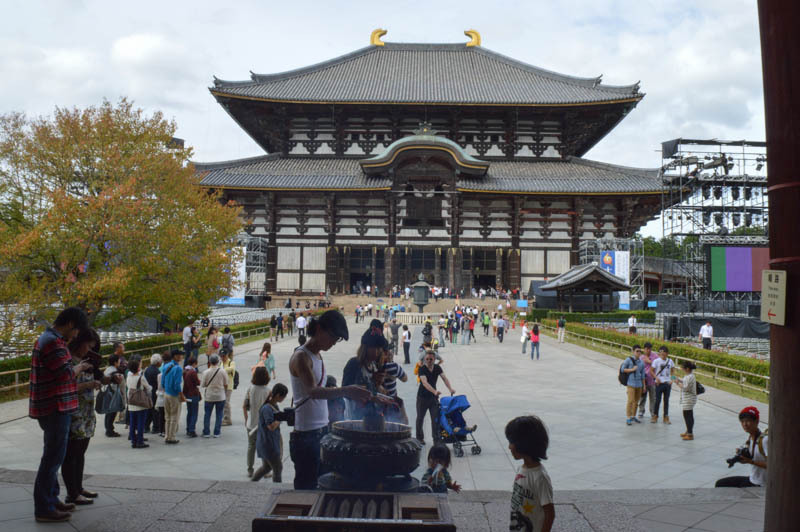 This temple is sometimes called Nara “Daibutsu”, Great Buddha of Nara. 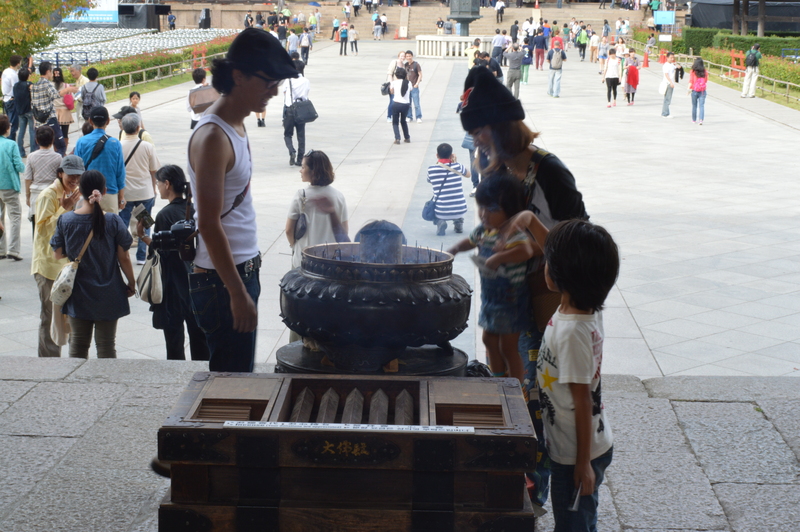 Under the Chu-mon Gate, visitors placed incense into a large bronze container. The smell of the incenses and sight of the grand temple added a sense of being aware and being present in a place of worship. I loved this moment – “being prepared for the yet to come”. We made a slow walk towards the grand “Daibutsu-den”. At its core is a magnificent golden bronze statue of the 15 meters tall Buddha. Worshippers and visitors alike mingled in the dim lit large hall with the air filled with incense. 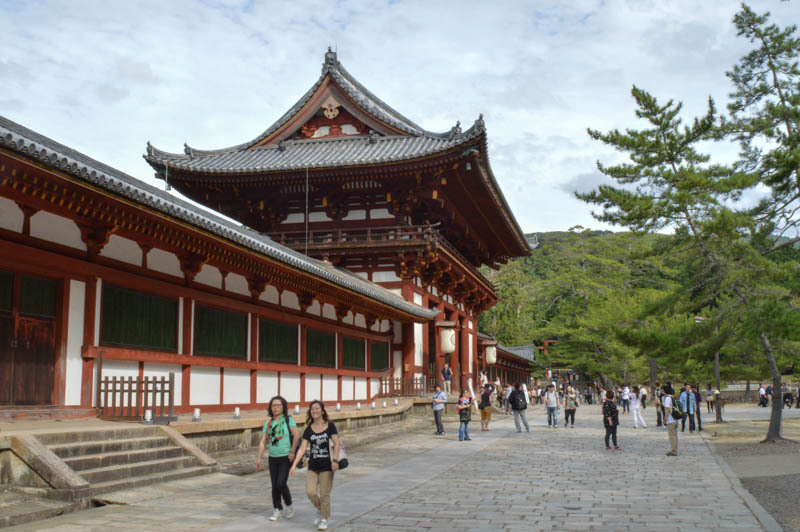 Although built during the Edo Period, these structures, including the Buddha statue, had been rebuilt. Today, although only two- thirds its original size, it is still very impressive and overwhelming. In one corner, people shook a bamboo canister enthusiastically until a stick emerged with a number on it. This number is checked against a corresponding piece of paper. Their faces said it all. Fortunes are available in English too! As I walked around this giant statue, I wondered why this wooden building and bronze statue was made the biggest. It did not fit with the Japanese psyche – reverence and worship of nature. The simpler things in life! These structures were intentionally made bigger. Was the motif to be over – powering? A huge human effort and endeavours, and certainly a huge cost must have been incurred in its construction. However, it is a magnificent piece of work. A passage through a hole in one of the giant cypress pillars ensured partial deliverance from sins. Great effort is summoned by some to squeeze through and much to their delight, having completed the process successfully. I sensed relief. Me, not quite there yet! Towards the exit, queues formed. Temple officials busily offered opportunities for donations. Their novel way was through donating individual grey tiles. Personal words and symbols can be inscribed onto the tiles. I inscribed out our family names. Just before the exit at the Chu-mon gate, I looked at the grey tiles on the monumental structure highlighted by the rather cloudy overcast. Someday, a single tile, somewhere in the Tōdai-ji complex, will carry our family’s names. I was contended. We passed the lake and reached the Great South Gate, “Nandaimon”. This impressive wooden structure is guarded by two imposing warrior-like statues. Outside the gate, sika deer gathered in numbers as usher’s to Tōdai-ji. More likely that their favourite sika crackers,”shika sanbei” are sold by vendors and fed by enthusiastic visitors. We ended on the main roads and replenished with some ice cream – “macha” ice. It turned out to be just that with no other ingredient. It was too little and too much. This was the only single “dish” that I did not consume completely. Soon, we were back in the din of Nara’s shopping arcades. Today’s excursion had been great, unhurried and quite inspiring. The nostalgia of Nara had truly gripped me. Nara did not disappoint me. It fulfilled all the ‘want to see things’. There was a sense of nostalgia – a journey through the history books of ‘Old Japan’. The historic temples, immaculate Zen gardens, preserved ancient streets, and above all the cultural identity had been retained. Being a compact city, walking seemed to be the best option of seeing and absorbing this atmospheric city. A lthough Japan is one of the most developed countries, hanging on to the past seems relevant. The society moved seamlessly between the old and modern. In many places, ancient relics, traditions and historic structures had become museum pieces. However, here in Nara and the wider Japan, it is lived and continues to flourish. The Japanese people had successfully integrated traditions with modernism. To me, this had been a highlight of our journey. Naramachi is one example. At every corner, a new discovery may be waiting. Artesian working on traditional textiles and materials, artwork or calligraphy, and our favourite, traditional food. I felt privileged to have been here, the first imperial capital of Japan. 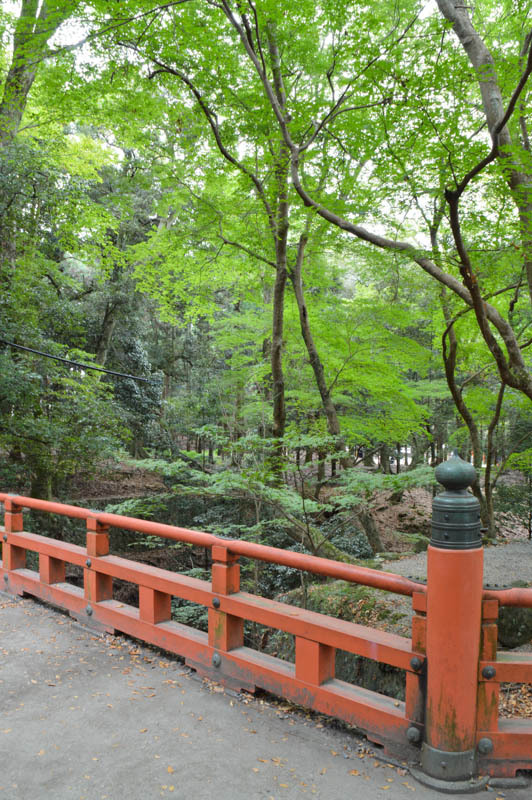 Walking around Nara and Naramachi is pleasant and is easily covered just by walking. Three major shopping centres lie adjacent to each other. 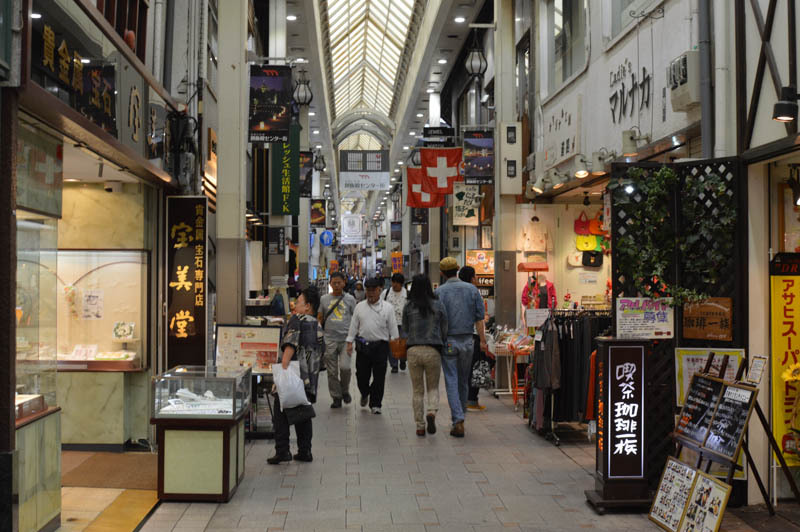 Higashimuki Shopping Street starting at the Kintetsu Nara Station and ends at Sanjo Dori. 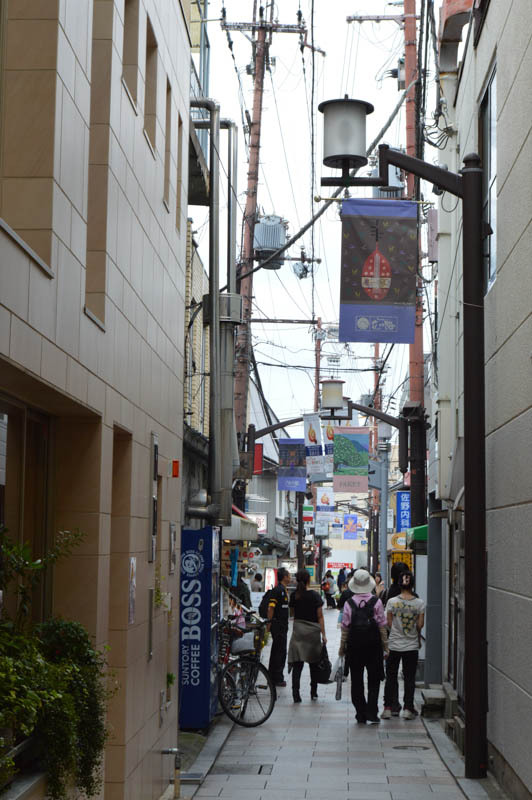 The Mochiidono Shopping Street begins from Sanjo Dori and ends at the old town district of Naramachi. Both these pedestrian only shopping centres are covered arcades. The main road of Sanjo Dori Avenue is the other major centre. A variety of items that makes a good gift to take home include round fans, “uchiwa”, Nara dolls, “ittobori”, bags and handkerchiefs, arts and crafts, cloths – all made from traditional Nara fabrics. We entered into a kitchen ware shop and obtained some beautiful handcrafted lacquer ware bowls and spoons. A local woman suggested to us the better materials to buy. I also bought a small ceramic with Fujisan on it as a memento. It was busy but relaxed. 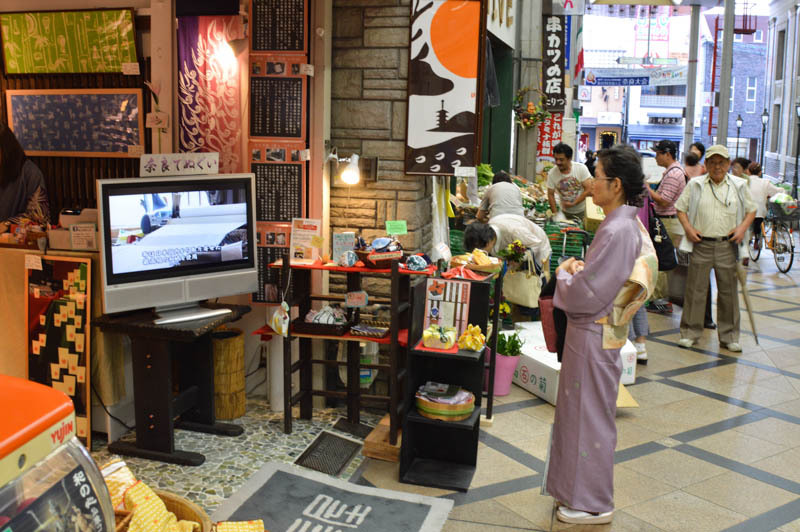 One common feature all around Japan are the 100Yen Shops. Beautiful kimonos and traditional cloths were displayed behind glass windows. Between these retail shops, there are numerous restaurants and eateries. It is a delightful place to people watch as well. In one of the arcades, three friendly girls dressed up in local traditional dress wished visitors. They are part of the team promoting Nara organised by the local council. 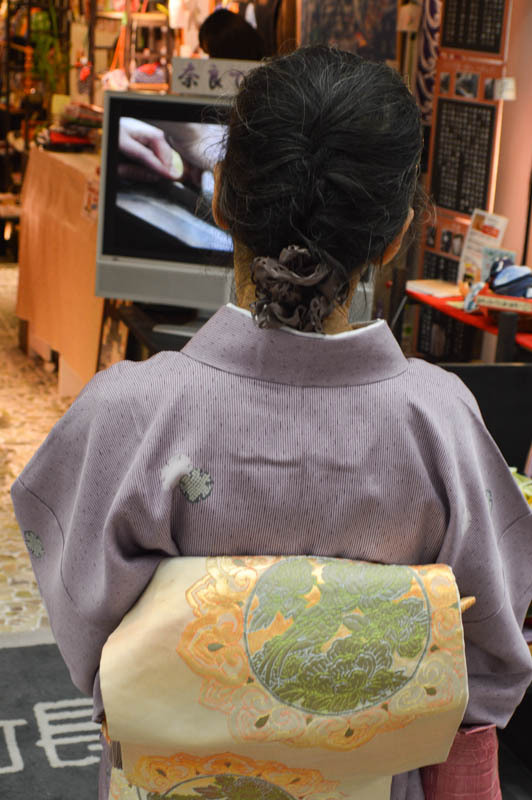 I watched an elderly lady dressed in a lovely kimono watching intently a sewing program on the television. The pace here is slow and people smiled often. 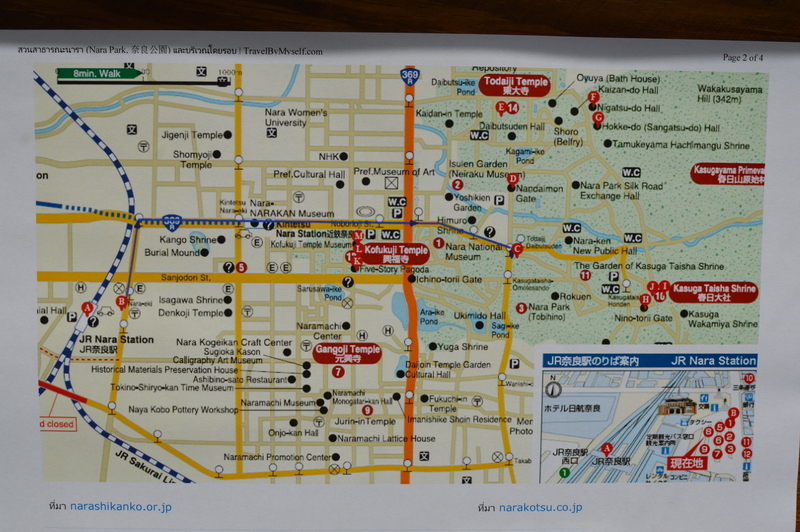 From these three shopping centres, several narrow alleyways branched off with more places to explore. On one street was an Indian restaurant. There is always something waiting to be discovered, perhaps even spotting the only “maiko” in Nara’s “hanamachi” in Ganri’in cho! After a wonderful meal and with our tummies filled, we continued our walk through a series of steps into another temple. 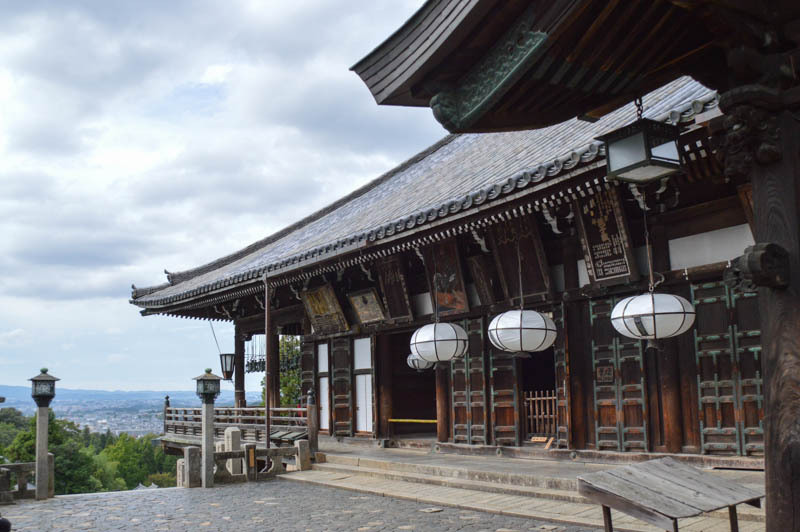 However, the group of temples here now came under one of Japan’s most famous temples, Todai-ji. There were several temples clustered together. 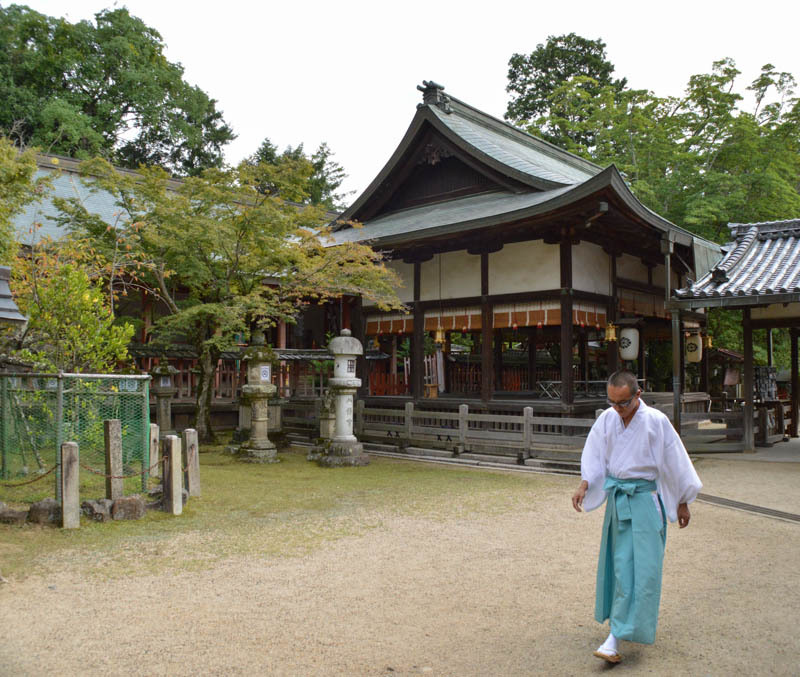 A few worshippers had gathered in this spacious temple ground, the Sangatsu- dō. A priest, with his mind pre- occupied, walked past us without any acknowledgment. Sangatsu-dō is the oldest temple in the Todai-ji group of temples. This shrine is sometimes referred as Hokke-do, “Hall of the Third Month”. The architecture of the tile roofed structures was quite impressive. Next to this cluster of buildings, a steep series of stone steps ascended to the popular Nigatsu- dō temple, “The Hall of the Second Month”. It was founded in 752. 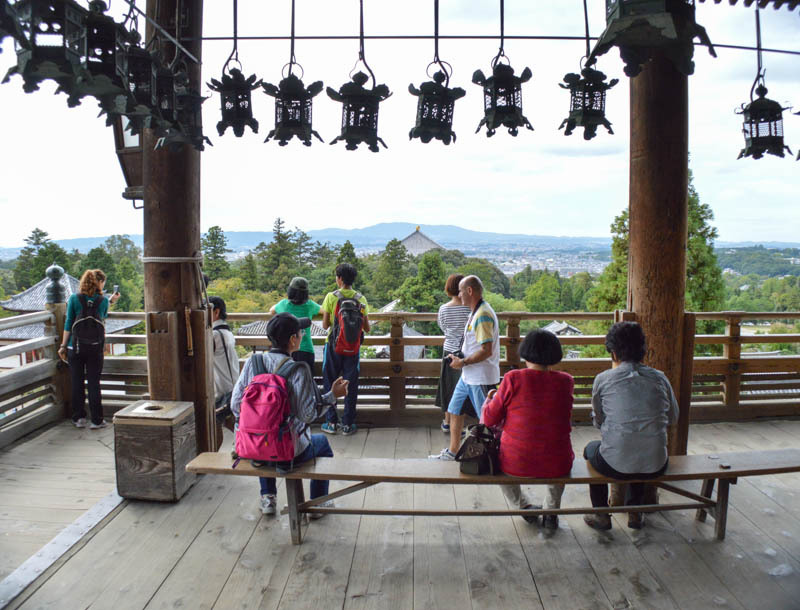 Sited on the hillside of Mount Wakakusa, the balcony presented a commanding view of the sprawling city. The main hall is over 350 years old and the beautiful architecture reflected old Nara designs. Over-sized oval shaped paper lanterns hung along the courtyard hang from the ceilings. Framed pictures and art hung above the doors. At the end of the spacious cobble stone courtyard, surrounded by tall trees and vegetation, worshipers cleansed their bodies at a dragon water fountain with the bamboo ladles provided. 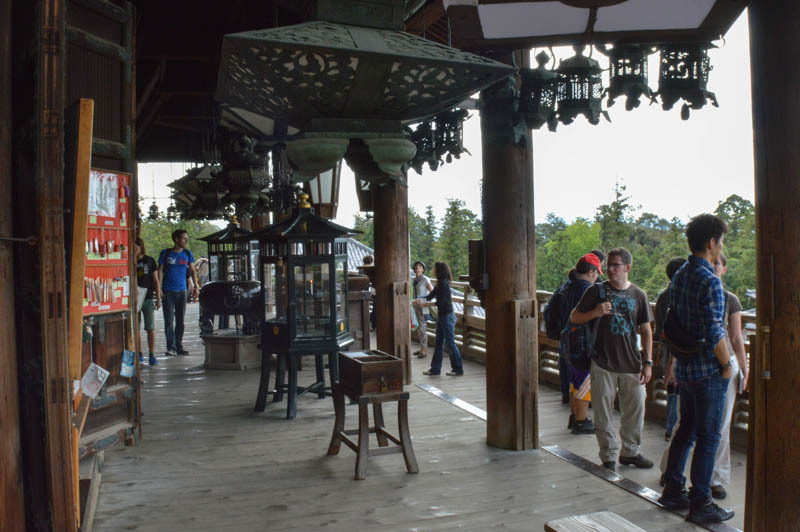 Under a row of bronze lantern hung above, the expansive views of Nara, from this elevated position, are visible. Both, the old and new buildings existed side by side in a densely planted city. At a closer proximity, is Todai-ji’s widespread temple complexes incorporated within Nara Park. There was an air of serenity. Everyone on this balcony looked out contemplating their own lives, young and old. Incense fumes filled the still air and worshipers prayed with clasped hands against their chest. They bowed several times in reverence. 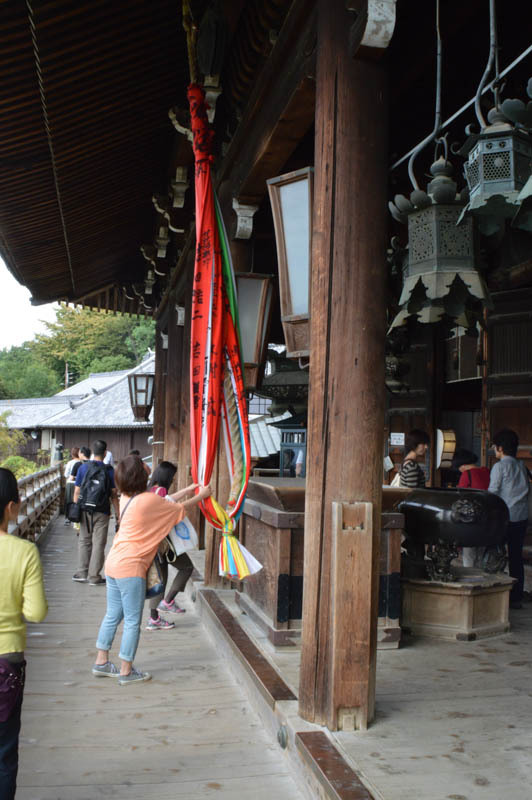 Occasionally, a bell was rung using a multi- coloured cloth hanging from the ceiling. Statues of the Buddha were placed inside the rather poorly illuminated hall. Silhouettes of people moved quietly, both with respect and consideration. Tiny flames from lamps flickered in the light breeze. Around the corner, the space opened up to a small internal courtyard. The floor was paved with granite stones and miniature plants sprouted from a rock garden. More oversized paper lanterns hung along a corridor. Nearby, a tea house was busy as steam from hot tea rose towards the ceiling. It was cozy and atmospheric. The interior was dark with strands of light streaming through a few open windows. We walked out of the complex by descending a steep covered step. This led us to a picturesque and delightful narrow concrete pathway through local homes. Vehicles, congested roads, noise and the usual buzz of a city were all absent here. As we continued our walk through the forested area, just the sounds of rustling leaves, the occasional softened chatter, gushing water in a nearby stream, could be heard. It seemed distant from the din of the city nearby. 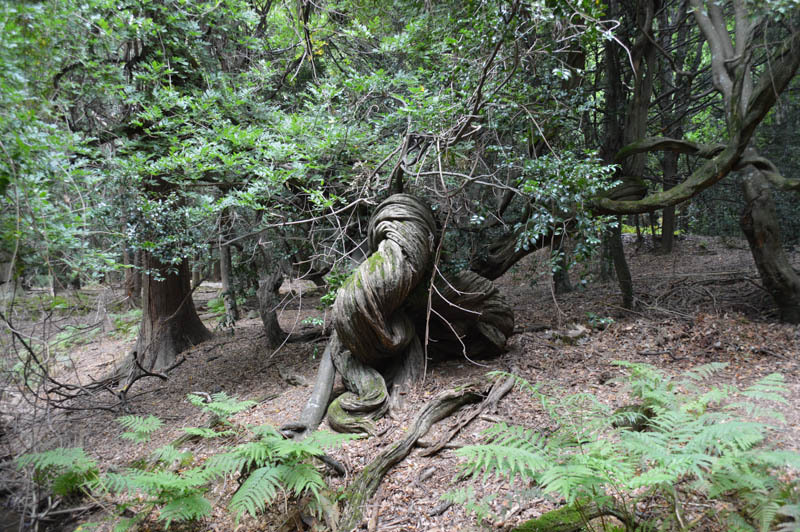 Along the path, a tree, twisted trunk with spreading buttress roots caught my eye. It was exceptionally captivating both in structure and form. The ground was bare apart from a few ferns. Such is the natural environment here. Maples and a variety of trees, both young and old, occupied this cool part of the forest. 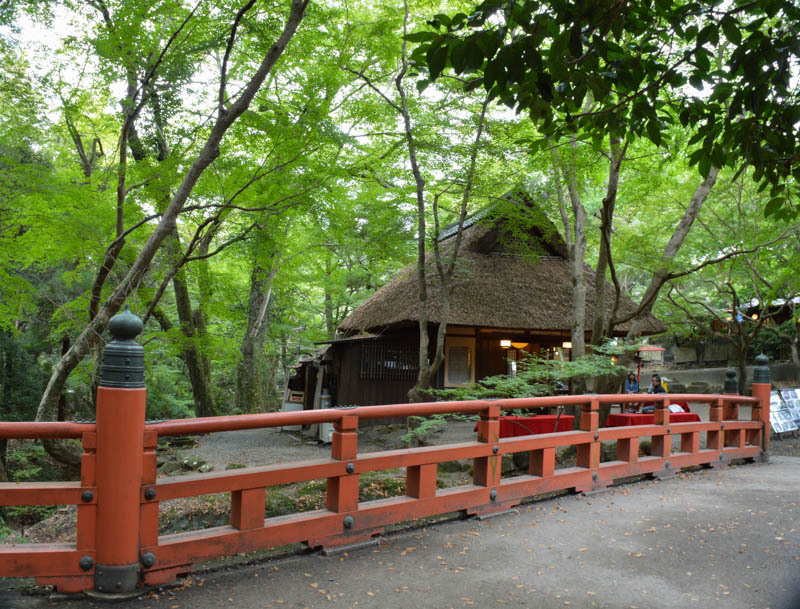 Not far, near a vermilion painted bridge over a slow flowing stream amidst the wooded forest is picturesque thatched-roof teahouse, “chaya”. A few low tables were set up outside under the trees. Across the bridge were a few more shops. We entered into a restaurant. It must be the most atmospheric place to eat, amongst this wonderful and refreshing greenery. The location was exceptional. Not quite under the trees but strips of bamboo roof instead. 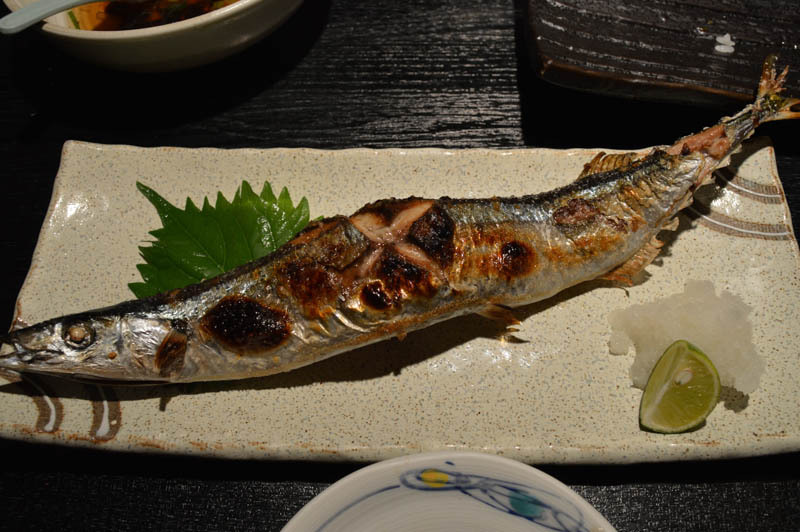 “Eating with one’s eyes is truly meaningful when it comes to the presentation of Japanese food. It’s appealing, appetising and could almost taste them. This, is even before consuming the dishes”. 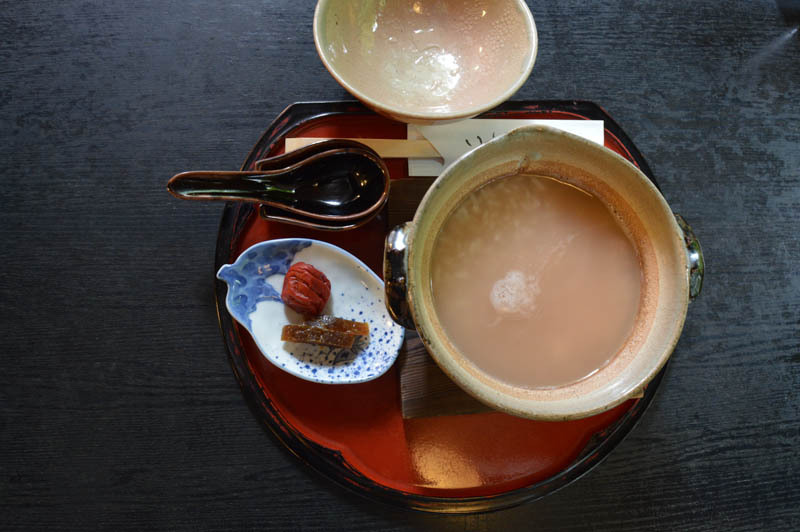 One bowl of rice porridge with “omeboshi”, “tsukemono”, pickled vegetables and fruits, and another boiled rice with tofu in “dashi” broth. These are accompanied with four dishes – tofu with steamed slice of ladies finger and crisp fried shrimp; boiled lotus root, a slice of courgette, potato; preserved daikon, four angled bean, mushroom, a mix of sweet potato and a gingko nut; fish meat wrapped with “nori” and a green stick of vegetable. 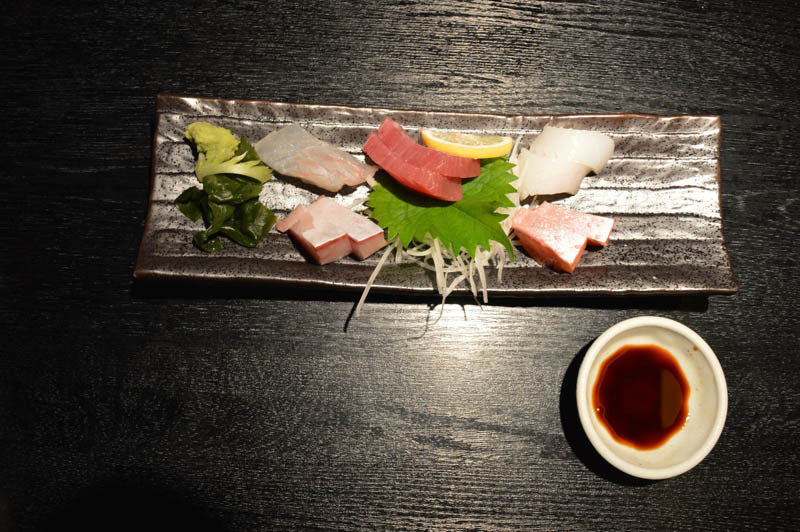 The dishes are either boiled, steamed or cooked with a riot of flavours – sweet, sour, salty, umami, “savoury”, slightly bitter, tangy and especially the pickled vegetables, tangy. 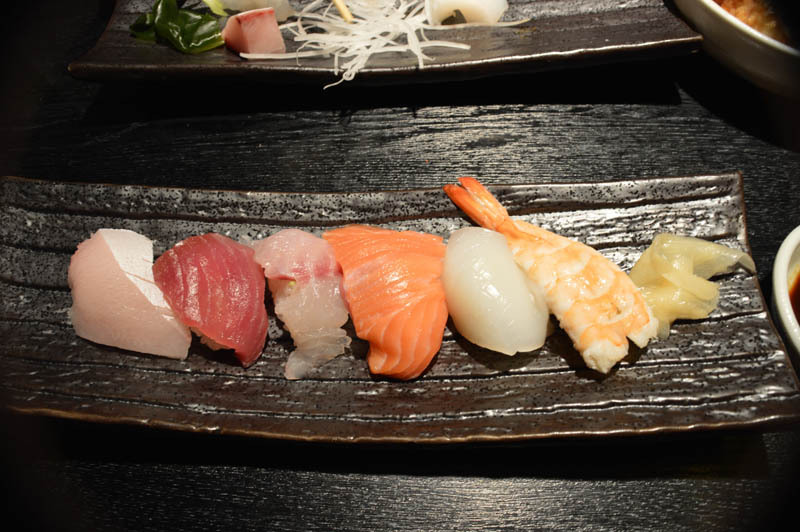 All this, slowly washed with miso and green tea. We are in paradise! Added to this is the green and serene environment. Nirvana perhaps but certainly close!